The Serpent in the Wilderness | "Northern Crossings"
The Old Testament lesson for last Sunday was Moses lifting up the Serpent in the Wilderness. The Gospel lesson is Jesus commentary on that text as well as the great “God so Loved the world”…. The passage in the Old Testament is amazing for a number of reasons. You can read about it in Numbers 21, but for me two things stand out. First is that the people and Moses pray that the snakes be taken away and they are not. 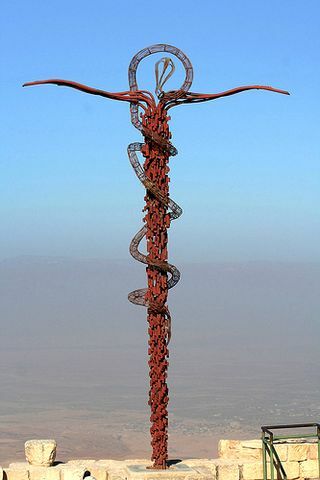 Instead God tells them to make a symbol of what is killing them and a reminder of the old serpent in the Garden as well, and when they look at it they will live. God takes a symbol of death and a curse and hangs Christ upon it and we live. The snakes were still there and the snakes and pains in our life are still there too. The remedy is to look up and live. Look to the Cross and be saved. Simple message – easily shared. I wrote this song a few years ago for the Lutheran Social Services of North Dakota – “Look Up and Live”. PreviousPartnerships, Mercy and Helping – part 4. NextPartnerships – the LWML, Bethesda, Human Care and the Dominican. Egg Heads and the Fall – What Happened to Humpty Dumpty? The Center of Their Lives. The Curmudgeon Speaks Again part 2.